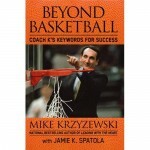 Many coaches and business leaders have written books meant to inspire their readers to become more successful in their jobs or daily lives, but rarely does the inspiration come across so sincere as from Coach K in his book “Beyond Basketball – Coach K’s Keywords For Success”. Coach K uses 40 words ranging from Balance to Ownership to Standards, and offers a combination of personal and basketball experiences to explain their meaning and takeaway through his eyes. At only 171 pages, the book is a pretty quick read, and it concludes with an explanation of Coach K’s famous analogy of “The Fist”, and how it brings together five words (communication, trust, collective responsibility, care, pride) to form one single powerful entity.